I have a similar issue as another user (but not quite the same) and I have done a reinstall following your suggestion. My issue is: when I click on the text of a specific checklist item, the camera won't shift to a proper view. 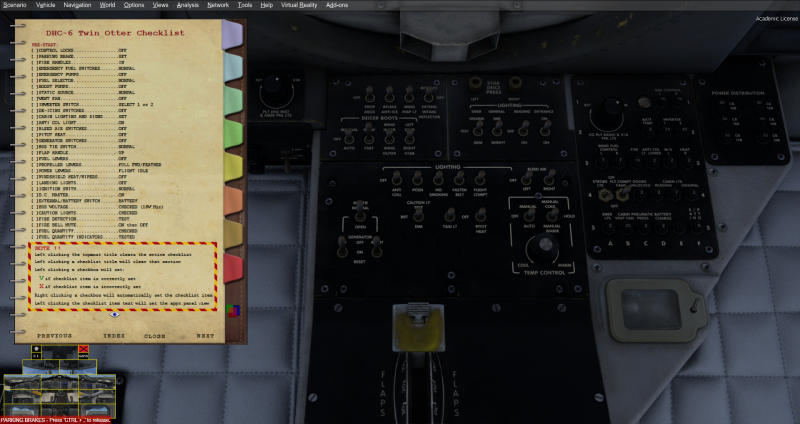 For example: if I click "Control locks" or "Parking Brake", it goes to the overhead panel (refer to my first pic). If I click "Fuel Selector", it goes to other improper view(my 2nd pic). It never goes to the proper view. What can I do to fix it? BTW, I am using Chasplane too, but it's the same even if I close Chaseplane. ps. I am using P3D v4.1, Windows 10 pro. version. I am unable to recreate this issue. I also find my panel view selector is a mess... I mean it's not the camera view as it indicated. I know you are unable to recreate this issue because it might be something conflicting or else. However, we would be appreciated if you could please help us clarify and solve this. I also do not have this issue (see small video below). Question is, do you have applied any tweaks? Are you using a 3rd party addon interfering with the built in view system of the Twotter, like EzDock, Chaseplan etc.? I have not used any tweaks. However, I do have Chaseplane installed. But as I said, this happened even if I have closed or disabled Chaseplane. So I am not sure if it's related. - install it again but do not activate Chaseplane and check again. I have the same problem as I describe in this video. No camera add ons installed and done a reinstall according to Mathijs advice. The checklist views and the panel views are not working as intended. What to do? As @Borgillios said, he doesn't use any camera addon but it's still the same. Maybe it helps you although it is for FSX. I have tried the solution to copy the camera.cfg, and it does not fix it for me. OK.. I have figured it out. And then open P3D again. I think everything will be fine then. At least it works for me. Does that mean I have to choose between Chaseplane and the Checklist camera? @mopperle Thanks for your suggestion! So you don't use any camera addon? Removing cameras.cfg dont fix it for me in FSX. Need som other fix. mopperle Thanks for your suggestion! So you don't use any camera addon? Gents, if Chaseplane is installed you should totally ignore the view system that we build in Chaseplane is simply a lot better. But as they change the system build in things can easily fail. And they can be very tricky to remove, I still have a camera called ChasePlane Camera in all aircraft even though chaseplane is no longer installed. Drives me up the wall. This ia s very old project and we currently have no plans to open it. Sad to hear since i dont have Any camera addons installed and bought your product two days ago. It does not work as advertized. See my previousy added video. Sorry, it does, see my video, and as you are the only one with that problem, maybe a fresh install could be the solution. You are right. This function is not a "must-have" one as long as we have some camera addon. It's just more convenient for us when we are still not quite familiar with where all the buttons and knobs are. To settle this issue... I installed the Twotter on my test machine (that is one that has a pristine P3d V4.1, reset every night) and it simply worked. It has to be a local issue on your machine that prevents it from working. 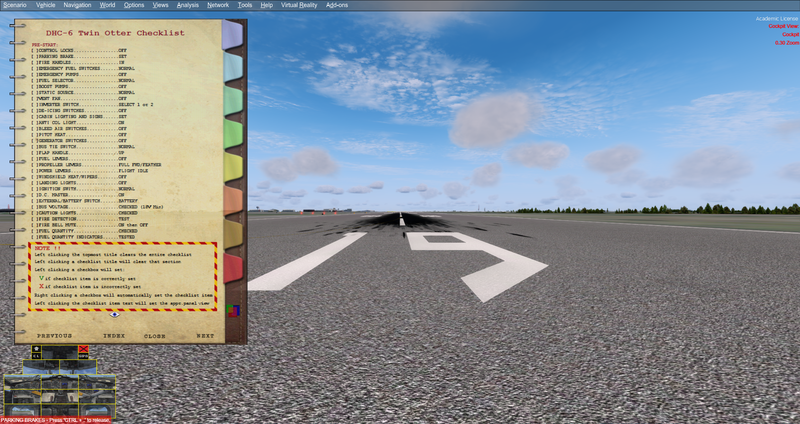 I run FSX sp2, have you tested that with the latest version of the Twotter? Well what kind of local issue could it be? I have done 2 reinstalls of the Twotter. I have dumped the camera cfg and i don’t have any camera addon.